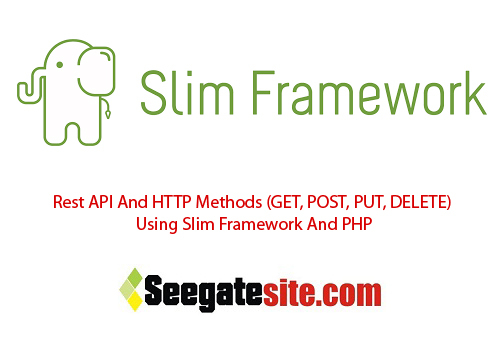 On this occasion I would like to share how to create, use and calling REST API on Slim Framework and PHP. This article is a continuation of my previous article “a basic introduction to slim framework“. Rest API associated with the http request method such as GET, POST, PUT and DELETE which the client will make a request to the web service. An application usually only perform CRUD (Create, Read, Update, Delete). In the Rest API, CRUD functions in accordance with the 4 HTTP method i.e., POST, GET, PUT, and DELETE. So we can choose the right method for REST API. In this article I will make a simple rest API to retrieve the data in JSON format. The application will perform the request against the rest api service that was created using the Slim Framework and accessed via the PHP CURL. In this example, the API request on PHP using CURL functions. PHP provides functions to perform the curl request using DELETE and PUT method. Here is a simple program to make the register form, login form, edit form, delete form and index page that applications will apply the http method ( GET, POST, PUT, and DELETE) using PHP CURL to perform a simple REST API request using Slim Framework. The login page will implement PHP curl to make requests with the GET method. The register page will implement PHP curl to make requests with the POST method. The edit page will implement PHP curl to make requests with the PUT method. The delete page will implement PHP curl to make requests with the DELETE method. Hello, I am a beginner at slim framework. I’ve tried this. and when I tested it at localhost/restapi/api/post/register, it showed an error “This method must be POST” is there something wrong on the codes? Thank you for the fast reply Mr. Sigit. I will try sour solution. Dear sigit, I follow your link to tutorial how to make api server using codeigniter, but I cant find product_foem.php code. could you help me again? POSTMAN used to test the POST Method if it’s work or not.